Last Chance to WIN Green Bay Packer Tickets! Our 3rd Annual Green Bay Packer Ticket Raffle Fundraiser will come to an end tomorrow when we draw winning pairs of tickets to each of the 8 Green Bay home games during the 2017 season! We are close to reaching our goal of $5,000 and looking for one final push before tomorrow's drawing. So, if you haven't already sold or purchased raffle tickets, you have one last chance today and early tomorrow to GO FOR THE GREEN & GOLD! 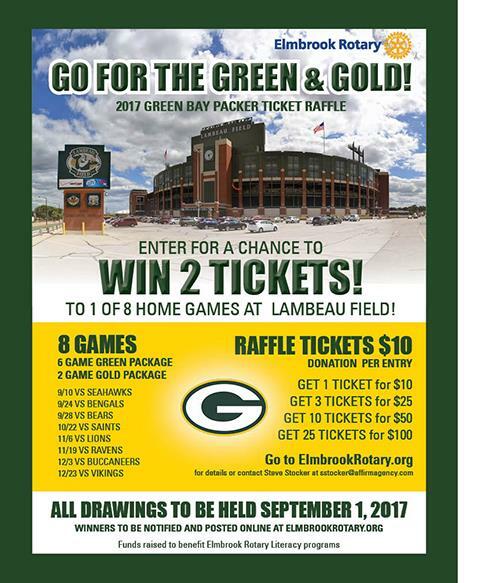 The Packer season is here and this is a great way for our club to raise additional funds that will benefit Elmbrook Rotary Literacy Programs including Diane’s Dictionaries, our programs at Capitol West Academy and more! See the attached flyer with information for any last minute sales to friends, family, neighbors and business associates. We’ve also been selling tickets at the Brookfield Farmer’s Market and local retailers over the last four weeks. Tickets are $10 each with 3 tickets for $25, 10 tickets for $50, and 25 tickets for $100. Winners will be drawn at our meeting tomorrow on September 1st, with 1 winner or 2 tickets for each of the 8 home games this season. Winners will be notified and posted on online at our website. Thanks for everyone's support and donations over the past month and watch for the list of winners who will be posted online and contacted in the next week! Questions? Contact Steve Stocker at sstocker@affirmagency.com or Gary Zwirlein at gzwirlein@hammespm.com for more information.